Home > News > Why Do Naked Mole-Rats Show an Absence of Pain Sensitization? Why Do Naked Mole-Rats Show an Absence of Pain Sensitization? The naked mole-rat is not your typical rodent. It’s cold-blooded, lives for decades, and does not experience certain forms of pain. Now, researchers led by Gary Lewin, Max Delbrück Center for Molecular Medicine, Berlin, Germany, have identified the molecular underpinnings of the animal’s resistance to heat hyperalgesia. They report that in sensory neurons isolated from naked mole-rats, nerve growth factor (NGF) fails to sensitize the capsaicin-sensitive transient receptor potential vanilloid type 1 (TRPV1) ion channel. This is because of tweaks to the kinase-binding domain of TrkA, an NGF receptor, making TrkA less able to engage intracellular signaling mechanisms that sensitize TRPV1. “The study is an interesting examination of the molecular basis of one form of pain sensitization in a strange African species, the naked mole-rat,” wrote Peter McNaughton, King’s College London, UK, in an email to PRF. Though this rodent is unusual, McNaughton thinks that “finding out why the NGF-to-TRPV1 pathway is less efficient might enhance our understanding of this pathway in other species, and moreover might open up ways of blocking it” in human conditions where pain stems from inflammation, as in osteoarthritis. The findings were published online October 11 in Cell Reports. It was by serendipity that Lewin began studying pain in naked mole-rats. In 2002, he was introduced to Thomas Park, University of Illinois at Chicago, US, who at the time was working on these rodents for completely different reasons, said Lewin. “He found that they had very few substance P fibers in the skin,” he added, the nerves that process and transmit pain information (Park et al., 2003). In line with that finding, Park and Lewin ultimately showed that naked mole-rats are not susceptible to some types of pain (Park et al., 2008). They shrug off pain-inducing chemicals such as acid and capsaicin, and do not develop heat hyperalgesia, either in response to inflammation spurred by complete Freund’s adjuvant (CFA) or to NGF released during inflammation. In 2011, Lewin and colleagues pinned the insensitivity to acid on a variant of the sodium channel Nav1.7 (see related PRF news story). But how evolution had done away with heat hyperalgesia was still unclear. Knowing that NGF-prompted heat hyperalgesia depends on TRPV1 sensitization, the researchers turned to the NGF-TRPV1 pathway to look for answers. Co-first authors Damir Omerbašić, Ewan Smith, and colleagues began by comparing electrophysiological responses to NGF in dorsal root ganglia (DRG) neurons from mice versus those from naked mole-rats. They selectively recorded from TrkA (peptidergic) neurons―that is, from cells not labeled with isolectin B4 (IB4), which binds mainly to sensory neurons that do not release peptides. They found that in mouse cells, NGF quickly sensitized TRPV1, indicated by an increase in the amplitude of currents evoked by capsaicin, a TRPV1 agonist. But NGF was unable to do so in neurons from naked mole-rats, suggesting a change in either TRPV1 itself or another molecule, in those animals. To test the first possibility, the researchers expressed the naked mole-rat version of TRPV1 in sensory neurons from TRPV1 knockout mice. Recording from TrkA-expressing neurons, they showed that NGF was fully capable of sensitizing TRPV1 currents, pointing to a molecule other than TRPV1 as responsible for the lack of TRPV1 sensitization. Likewise, when naked mole-rat TRPV1 was expressed along with rat TrkA, this time in naked mole-rat fibroblast cells, calcium responses were sensitized by NGF. The findings indicated that naked mole-rat cells have the machinery needed to sensitize TRPV1. With TrkA as an alternative candidate to explain the lack of TRPV1 sensitization by NGF, the researchers next expressed rat TRPV1, and either rat or naked mole-rat TrkA, in frog oocytes. With naked mole-rat TrkA, NGF sensitized currents evoked by acid less so than with rat TrkA, reaching a similar level only when the concentration of NGF was raised 10-fold. The authors therefore concluded that naked mole-rat TrkA was less efficient at sensitizing TRPV1 than its counterpart in rats. Indeed, naked mole-rat TrkA did not activate downstream kinases as strongly as rat TrkA. As for why, the researchers found that naked mole-rats carry between one and three amino acid substitutions in the kinase-binding domain of TrkA, compared to five other African mole-rat species. “What surprised us was how small the change could be,” said Lewin. 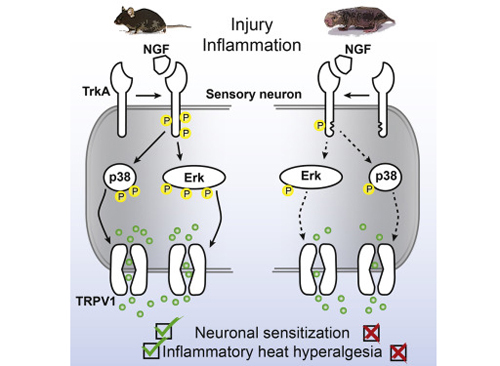 The study is “very well performed,” said McNaughton, “and the conclusions are well supported by the data.” Overall, the study shows that NGF cannot sensitize TRPV1 in naked mole-rat sensory neurons due to at most three changes in TrkA. Because sensitization of the ion channel is needed for heat hyperalgesia, the findings indirectly explain why these mammals do not feel the painful effects of NGF. There are additional ways, however, that heat hyperalgesia could be prevented during inflammation. “A limitation of the study is that only one pathway, from NGF to TRPV1, has been studied,” said McNaughton. “Other pathways involve inflammatory mediators such as prostaglandin E2, the target of non-steroidal anti-inflammatory drugs (NSAIDs), which sensitize TRPV1 by a different mechanism and which also act on other targets.” Such pathways would likely not be affected by the TrkA receptor, he added. Still, for Lewin, the naked mole-rat TrkA receptor is another example of how evolution can validate two of the pain field’s main strategies to relieve pain. “In both cases that we know of, where pain has been altered via a variant of Nav1.7 for acid-induced pain or of TrkA for NGF-induced pain, the gene that actually produces the change has turned out to be one that’s very popular to make analgesics against,” he said. Small-molecule drugs for Nav1.7 have looked promising in clinical trials (see related PRF stories here and here). And while not as far along, pain researchers have also been developing TrkA inhibitors (see related PRF story). “Evolution chose the TrkA receptor to fiddle with before we had an idea of what TrkA was,” Lewin said. Hypofunctional TrkA Accounts for the Absence of Pain Sensitization in the African Naked Mole-Rat. Cell Rep. 2016 Oct 11; 17(3):748-758.